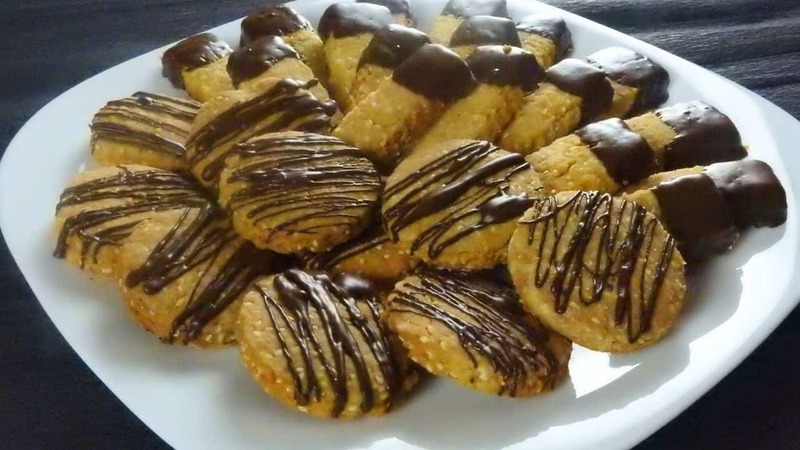 An easy fasting recipe for delicious crunchy orange cookies with sesame seeds and dark chocolate. In a large bowl whisk together orange juice, corn oil and melted margarine. Add the sugar and mix until it’s completely dissolved. Mix in the orange zest and the sesame seeds. In a separate bowl whisk together flour, baking soda and baking powder. Add about half of the flour into the bowl with the liquids and whisk until the mixture starts to thicken. Add the rest of the flour mixture and knead gently until it’s completely incorporated. Cover the bowl with plastic wrap and refrigerate for 30 min. Take the dough out onto a well floured surface. Work it for a few seconds until it comes together. Roll the dough out until it’s 1cm / 0.4” thick. Cut it into stripes and each stripe into smaller rectangular cookies. Transfer the cookies onto a paper lined baking tray. Repeat the process with the rest of the dough. Cut cookies into different shapes. Bake in a preheated oven, at 180⁰ C / 350⁰ F, for 25 minutes. Dip one edge of each cookie into the melted chocolate or decorate them as you like. Allow the chocolate to set before serving. Enjoy! !